In 2006, Rae Ritchie started out in the fashion industry, designing women’s and kids’ fashion accessories for major retailers. “It was creative,” she said, “but I most felt alive while creating prints and graphics for those products.” She was always painting on the side, so Rae decided to focus on fabric design and illustration for greeting cards, stationary, gifts and apparel. I’m so glad she made the transition and so are our clients! Rae lives with her husband and her cat Nomi in Minneapolis, MN. 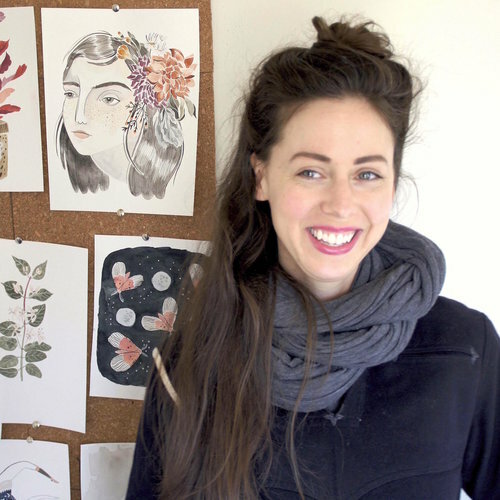 “My watercolor and gouache paintings are created in a sunny little room in my home,” she said. Rae confesses that she’s greatly inspired by the lushness of nature, classic children's books and old photographs. It shows! Rae’s clients include Los Angeles Times, Dear Stella Design, Oopsy Daisy, Workman Publishing, Peter Pauper Press, Calypso, Where the Polka Dots Roam, Sellers Publishing, Design House Greetings, Manhattan Toy Company, and American Greetings. And she’s always adding more.